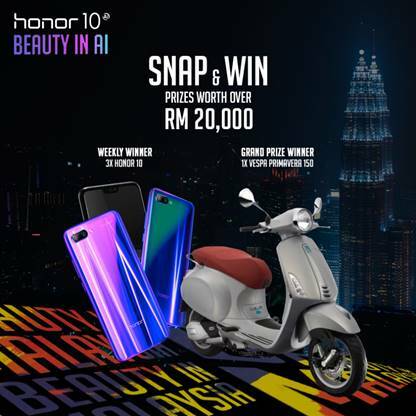 honor Malaysia, the leading mobile device e-brand, is launching its #BeautyinMalaysia photography contest to showcase the beauty of Malaysia interpreted through the lens of honor smartphones, by Malaysians. The photo contest is open to users of honor smartphones, and will run from 2nd to 22nd July 2018. Lucky winners stand a chance to win the grand prize of a Vespa Primavera 150* or three units of the ‘AImazing’ honor 10 – a vibrant and powerful handset with 24MP + 16MP dual-lens AI assisted cameras and the industry-first Semantic Image Segmentation technology, which allows you to take apart different layers from an image and also identify multiple objects in one single image. honor hopes to encourage Malaysians to capture and share every beautiful aspect of the country throughout the month of July, leading up to the National Day in August. “The honor 10 received great response from Malaysians since it first launched, due to the features of the smartphone which are specifically engineered and designed for photography, and we know how much Malaysians love taking photos of everything around them. Hence, we, at honor Malaysia are happy to reward winners with the honor 10 as main prizes, and also to provide this platform to inspire and motivate our fans and customers to interpret this beautiful country beyond limitations,” added Zhao. The contest consists of three themes for participation, and will run on honor Malaysia’s social media platforms, namely Facebook and Instagram. Contestants are encouraged to submit entries for all three themes (stated below) and more than one entry for each theme in order to stand a higher chance at bringing home the prizes. Entries will be judged by a line-up of professional photographers and representatives from honor Malaysia based on the level of creativity and how each photo embodies the theme of “Beauty in Malaysia”. Winning entries of the contest will also be featured on the hihonor website, the honor theme app and honor Malaysia’s official social media platforms where images will be combined into a series of high definition, scenic wallpapers for users of the smartphone brand to view and utilise globally. The winner also will receive the opportunity to be honor’s exclusive speaker for future honor events.